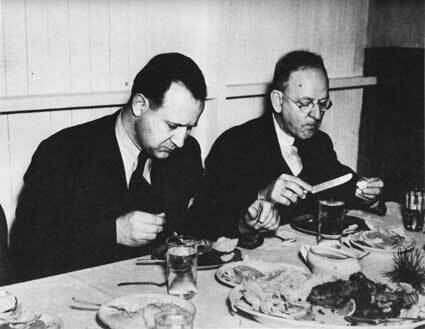 Conrad L. Wirth (left), Director of the Civilian Conservation Corps program within the National Park Service, (1936-1942) and Civilian Conservation Corps Director Robert Fechner (right) (1933-1939). At this time Roosevelt probably had no definite plans on how to implement such a program. During the presidential campaign, he corresponded with Gifford Pinchot and other interested conservationists and gave speeches in Atlanta and Boston calling for forest work for the unemployed.